I love to eat, I love trying out new restaurants, checking out the latest food craze, and discovering new food finds. I enjoy documenting these things to remind me of the experiences and memories of the things I love to do. But once in a while, I also write about things I love other than food. If you're following me on Instagram, you'll see that majority of my posts are food shots of what I've eaten, or where I've been eating. At the same time, you'll also catch some snippets of my everyday life other than eating out. Just recently, I was invited to try this new nail spa located just a few blocks away from the office. 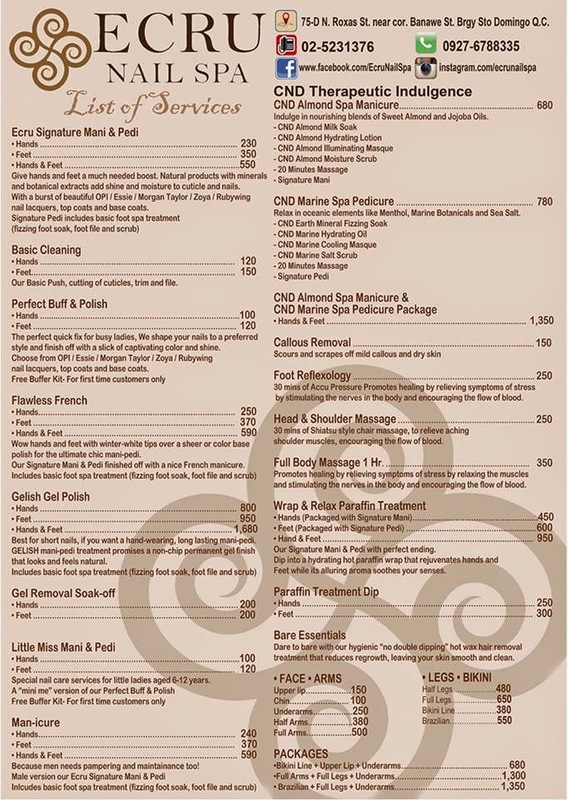 ECRU Nail Spa in Banawe is one of the few salons in the Metro that offer CND spa services. They offer both CND SPAMANICURE® and CND SPAPEDICURE® to clients who want a complete premium nail spa service from fingers to toes. I tried Ecru's Signature Manicure (P230) for my hands, and Gelish Soak-off Gel Polish (P800) was also applied to my nails. Their gel nail polish is priced higher than regular nail polish, but it was definitely one of the best and shiniest polish my nails ever had. It was also convenient how gel polish dries up fast so you don't have to worry about reapplying I never liked gel polishes before, because aside from the fact that it's more expensive, it also needs skill and expertise to apply it. Ecru Nail Spa has skilled and experienced nail therapists/technicians who even came all the way from Dubai. With that, rest assured that your hands and feet are in good hands. Plus, they use only the best and premium nail polish brands- Gelish, Morgan Taylor, OPI, Essie, Ruby Wing, Zoya. Ecru Nail Spa offers CND Almond SpaManicure (P680) to soothe tired hands and leave them soft and sweet-smelling. Their CND Marine SpaPedicure (P780) was applied on my feet and it was the most cooling and relaxing foot spa ever! The whole process was very gentle and calming I felt really sleepy afterwards. What I love most about Ecru Nail Spa is their emphasis on hygiene. Each new customer availing their manicure and pedicure services gets a free personal buffer kit with toe separators. Aside from that, they use sterilized metal files with disposable sandpaper grit to ensure that clean and new files are used every time-a feature often overlooked by most nail spa establishments. Ecru also offers hot wax hair removal treatment for the face, arms, legs and bikini lines. It is still shiny and the only difference is that my nails grew longer creating a gap on the cuticle. Overall, my experience at Ecru Nail Spa was beyond expectation! Their nail technicians were friendly and knowledgeable, the environment was cozy and relaxing, they have a good line up of nail polish brands, they give extreme importance to hygiene and sanitation, and their rates are reasonable. I can't wait to go back and try the CND Almond SpaManicure and their paraffin treatment next time. I must say you are one of the big food lovers.